By now I'm sure you've gotten tired of playing those new games with their fancy graphics and easy controls. You're sitting there thinking, 'I'd really like to play some old games, but which?' Once again I am here to the rescue. This time with a classic game you can play with a loved one. 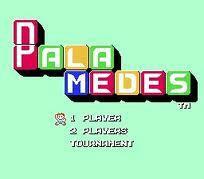 When it was released it had to compete against Tetris and Dr. Mario, which were similar in play. Palamedes largely got left behind and forgotten. There was a sequel released in Japan so I can't comment as to the quality of it. It was also released on Gameboy. In single player the only real story is that you're in a tournament against different players in the world, all human with the exception of a dog. I guess the dog must be particularly gifted. Nothing fancy. As all the game play is on a single screen like Tetris, with tiles (they call them dice, but they look more like dominoes) coming down. Pretty basic. This game could easily be converted to a cellphone game. Sweet mercy... It's one of those tunes that'll crawl inside of your head, lay down a blanket, a bag of chips, and have a picnic. In other words, a classic NES tune. Your character only moves from side to side as you shoot tiles to their corresponding number. More then anything this game requires quick thinking and strategy as how you eliminate the tiles adds up to lines you can delete all at once. The controls are so simple that a toddler could pick it up. Endless. Like all the best puzzle games this is one that you can easily blow extra minutes here and there on. It's even higher if you factor in playing against someone. This is one of those games that's fun to play against someone you love, cause by the end of the first round, you'll be hating each other. In dual mode you can actually build up lines of tiles to quickly dump on your opponent. Flaws: The tournament play is a bit short. Once you get good at the game, you can cruise through it in no time. Single player is really only fun for a few minutes. The main strength of the game is in two player. I loved this game and don't know why more hasn't been done with it as a property. It's practically begging to be adapted for cellphone gaming. Heck I'd love to see it on the Wii with the option to play online. It would open it up to new realms. This is a game that is great to sit around with a group of people taking turns against the winner while you listen to music or watch a movie. It's fun but even so the fact that it's really best as a two player game will lose it some points. TS-I have a friend who would love this! I love old 8-bit games. They feel like home to me. I can see why it became the sibling that Tetris and Doc Mario never spoke about. It's like a poor man's bejeweled. I really like your new review style. Way to get all intelligent and more interesting to read. Even the color scheme is better. Now I have to work twice as hard to steal followers away. I played both tetris and Dr. Mario ad nauseum...but I don't remember this one. I missed out! I don't know if you have a fancy xbox 360 or ps3 or wii - but I am a huge fan of the fact that game companies are pumping out little old-school type games. For example, some buddies of mine and I this past weekend rocked out to some Scott Pilgrim (essentially an up to 4p arcade game). Thumbs up for simple, addictive games. Wow I havent even heard of this one, but I am a die hard puzzle game nut so I will have to try it out on my emulator!